The title of this column may surprise some people. It seems that lots of folks don't think there are any expectations that need to be fulfilled on the part of prospective godparents for Baptism and sponsors for Confirmation. I am not sure how such thinking took root in many of our families, but it did. It certainly wasn't the case back when I was a youngster. And it isn't true today. Recently I sent a letter to our priests and pastoral ministers about questions that are often raised when individuals are asked to serve as sponsors for Confirmation or godparents for Baptism. I encouraged pastors to print my letter for these folks in their parish bulletins or to use it in whatever way they might find helpful. It's no secret and I thought it would be good to share my thinking with all of you as well. Sometimes youngsters don’t even know the names of their godparents or sponsor. I do and that’s because my parents made sure I knew. We often visited these folks and they all supported me lovingly and sometimes even generously. My godparents for Baptism were friends of my Dad, Charles and Lillian Havranek. Uncle Charlie, as we called him, was a pharmacist just like my Dad. My Confirmation sponsor was Dr. Philip Campagna. His office was located just above my Dad's pharmacy. Obviously Dad had considerable say in the selection of these folks. Mom was no wallflower in such matters, but she must have let dad take the lead, which probably wasn't a bad idea since mothers typically need to prod their husbands to be involved in the religious formation of their children. My godparents' response certainly would have fulfilled the expectations I outline in my recent letter to our pastoral ministers. Bishop Steiner and I just completed the Rites of Election across the archdiocese for those who are preparing for the Easter sacraments. Lots of godparents and sponsors participated in these ceremonies. They too will be well-served if they are advised beforehand about how they can legitimately and effectively fulfill their roles. Allow me now to expand a little bit on some of the qualifications I cite in my letter. First of all, godparents and sponsors must be at least 16 years old and should have already received the three sacraments of Christian initiation, namely, Baptism, Confirmation and First Eucharist. In other words, to show neophytes the ways and means of discipleship, they themselves need to be familiar with them. If some persons have not yet received one of these sacraments, they should decline an invitation to be a sponsor or a godparent until they do so. Godparents and sponsors also should be practicing Catholics. They should participate at Mass on Sundays and holy days and they should receive the sacraments of Holy Communion and Reconciliation regularly. The whole purpose of the sacramental life of the church is to nourish us on our journey of faith. If those who lead the way are not nourished properly, they will falter and eventually be unable to keep up with the pace of Christian living. When that happens, how can they lead others? We often talk about the Christian vocation. Sponsors and godparents should be living the Christian vocation faithfully and conscientiously either as a single persons or as persons validly married in the church. Yes, religious and clergy can serve in these roles. But some married persons, unfortunately, may not be eligible. Those married by a justice of the peace, those living together without the benefit of marriage and those who have been divorced and remarried without a declaration of annulment from the diocesan tribunal concerning the previous marriage(s) are not eligible to fulfill the role of godparent for Baptism and sponsor for Confirmation. It is possible to rectify that situation, but, unfortunately, one cannot do so hurriedly. This is why pastors always encourage folks not to procrastinate when they find themselves in such a painful dilemma. They are not excluded from the church community but they have incurred some impediments which limit their participation in the full sacramental life of the church. Godparents and sponsors also should be striving to live out in a very active way their own baptismal commitment to Christ and his church by the way they treat others. Obviously discrimination, intolerance, hostile alienation from relatives, acquaintances and neighbors clearly raise serious questions about the quality of one's Christian life. Furthermore, they should believe all that the Roman Catholic Church teaches and believes and should be making a serious effort to lead a life of virtue, avoiding temptations that inevitably lead to sin. 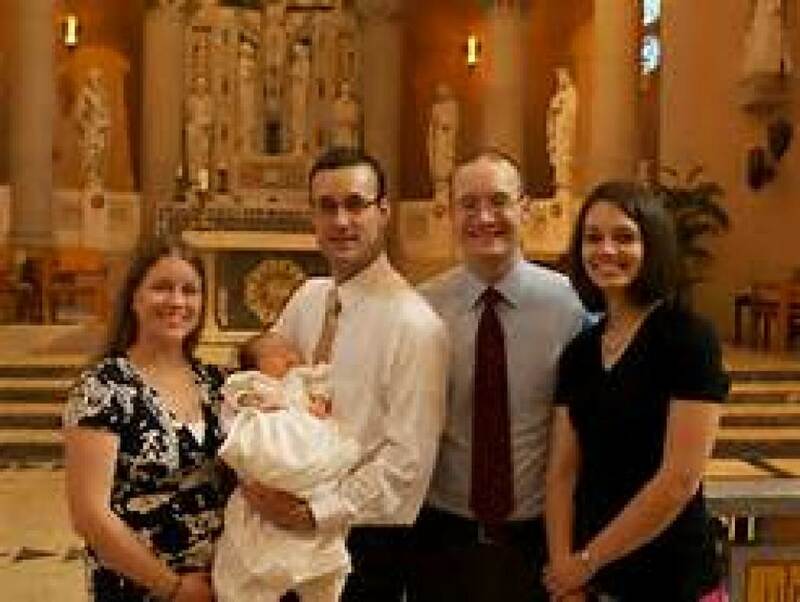 Parents of those to be baptized or confirmed are not eligible to serve as godparents or sponsors. They have a more important role as first teachers of the faith. Furthermore, they should be at least 16 years of age and thereby be able to assume the responsibility which God and the church place before them in serving as guides and companions for those being welcomed into the life and full share of the mission of the church. Last but not least, godparents and sponsors should promise to give their support to these sacramental candidates by their prayers and the example of their Christian lives each and every day. The roles of godparents and sponsors are serious and effective evangelizing resources for our church's mission. In many ways, together with parents, godparents and sponsors are the principal formators in the way of Christian living for those whom they accompany to the saving waters of Baptism and the holy anointing of Confirmation. Only those who honestly and sincerely can acknowledge their compliance with these qualifications are eligible to be sponsors for Baptism and Confirmation. Does that mean anyone who struggles from time to time in living a life of virtue or understanding a serious teaching of the church is excluded? By no means. Were that true, most of the saints of the church would be excluded, as would I. One of my own personal regrets is that I was never asked to serve as a Baptismal godparent or Confirmation sponsor. It's a little too late in life to assume such a role, but I pray that all of you who are so privileged will take to heart what I have outlined here today and will calmly and faithfully accompany and support our neophytes in their efforts to lead a Christian life.